Description (From Goodreads): For Zack Thomson, life in the Nicholls Ward wasn't so bad. After his parents died, he developed strange allergies, and the mental institution was the only place where he could be properly looked after. As strange as it was, it was home. But that all changes the night a stranger on a Harley crashes through the front doors and tells him to run. Along with his best friend Charlie and a girl he may or may not be falling in love with, Zack does just that: run. Under the cover of night, hiding amongst the shadows, he races for the truth. 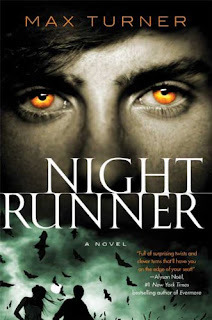 Night Runner by Max Turner held a lot of punch. The entire story is one crazy ride in the newly exciting life of Zack Thomson. For the past eight years he had been living basically in isolation inside a mental ward. He has a plethora of allergies - including an extreme reaction to the sun. Therefore, he sleeps all day and lives at night. He also cannot stomach food, he has to drink special concoctions, which he dubs "brain cocktails". The only two friends he has are Charlie and Nurse Ophelia. Charlie has been around his whole life, the boys were friends before Zack was orphaned and his condition started. Charlie is his only regular visitor and his best friend. He is a mischievous, daring character who often pushes the limits. However, he is liked by most people and he is Zack's right had man, and is there when he needs him the most. Nurse Ophelia, Zack's only other "friend" is the night nurse at the ward. She seems to really take to Zack and often defends him when he gets one of his mood swings from not eating. She occasionally takes him out to movies and things; basically she is the closes thing to a mother he has. This book is incredibly plot driven. Right in the first few pages Zack's safe world is shattered (literally) when a crazed old man, who turns out to be a vampire, crashes through the mental ward and tells Zack he is in danger. This starts a long chain of events that keeps Zack on his toes and on the run. While the plot was definitely exciting, I just wish there was a little more character development. I think that Turner did a magnificent job with Zack - he is one of the funniest narrators I have seen in a long time. He makes tons of pop culture references that I always found hilarious. For example, he drops this little jem on page seven, "He's coming," he continued. "He could be here any second". The man put a hand on my shoulder and pushed me gently toward the motorcycle again. He looked back over his shoulder at the parking lot. I got the feeling Darth Vader was about to waltz in and lightsabre us both in half". He is also a big fan of the Tolkien masterpiece, The Hobbit and often makes snide comments referencing it. Zack is also struggling with the new revelation that he is a vampire. He is delighted to finally have some answers, but he isn't crazy about the diet or the whole "evil" thing. He makes a promise to himself that he will remain "good" and not go on a crazy killing spree. I love this quote from him about his decision (pg. 49) "Well, I had no doubt in my mind what I would choose. I would be good. I certainly wasn't a threat to anybody. I didn't even believe in mousetraps." But, the fact that Zack is such a great character only made me want to get to know the other characters better. The rest of the cast is highly underdeveloped. Like I said before, the book is highly plot-driven and unfortunately the rest of the characters suffer. I loved what I saw from them, but I was left wanting more - especially with Luna. Luna is Zack's love interest in the book; although she doesn't appear until almost halfway through it. He meets her through Charlie - Luna is Charlie's girlfriend's (Suki) sister. We get a few details about Luna, but not a great sense of the character. I hope that in the upcoming books we will see more from her. However, I loved both the plot and the idea behind the story. This isn't just another run of the mill vampire story. What makes this so incredibly unique, is that, one: Zack has been living the past eight years as a vampire, and had no idea. The second aspect of this story that makes it a standout is that this is more of an action story. There are no melodramatic vampires moping around looking for human companionship. This is a on the edge of your seat action ride that never really lets up. It's a refreshing change of pace. 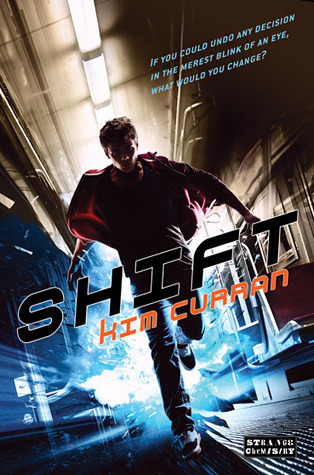 While I enjoyed the majority of the plot, I did have a problem with the ending, at least the last 20 pages or so. I don't want to give it away for those of you who haven't read it, but the events that occur seem to have been taken rather lightly. I know that for the story to progress, the plot had to go into that direction, but everyone seemed to go with the flow a little to easily for me. For those of you who have read it, I'll give you a clue as to what I am talking about - Charlie and Luna. But, honestly, besides that last 20 pages, the plot was amazing; it was action packed, exhilarating and hilarious. Night Runner was definitely a page turner. I just hope that in the next book, End of Days, the secondary characters, like Luna and Charlie are developed a bit more. Ohhh I like the sound of this one! Zack sounds hilarious, it's too bad the rest of the characters aren't fleshed out as well, but it seems like the plot makes up for some of that. Really nice review Sarah, this one is new to me and I'll definitely be checking it out! Ooh, I haven't heard of this one before but on your recommendation have added it to my TBR pile. Thanks!